And was deeply disappointed. Apparently Electroscope are trying to be more psychedelic and less "modern". Based on the other work i have heard by them i would have compared them to Piano Magic. They seemed to do the same sort of flowing ambience. I really enjoyed everything. Up to this. There are three songs here, let me examine each, and maybe you will see what i mean. The first tune is the title track, Out on the Edge of Time. In it a strange drone (cello maybe -- i can't tell) combines with harpsichord, flute, and voice for an airy and wierd tune. This song sounds like an early psychedlic experiment from, say, 1967 or so. It is, well, strange. Not good, nor bad, just very very odd. Side A concludes with Icicle Bells, in which cello, xylophone, and strangely plucked guitar combine in a way that really invokes winter. This is a short interlude, the whole piece being only a minute or two long. However, it is charming, and definitely the best piece on here. The b-side contains one longer piece, Glycerine Gold. This really sounds like something Roger Waters would have done. Really -- it has a certain Pink Floyd-ishness to it that i find quite enjoyable. The guitar is a little more focused than it was on Icicle Bells, but the flute is till here. The male voice, though, is was really reminds me of Waters. The vocalist whispers fastly and somewhat breathily, just like Roger on the Final Cut. Overall though, there is too much flute, and the guitar never moves at a pace above "plodding". Again, the Waters comparison springs to mind, although to the over-intellectualized stuff he did on some of his later solo albums. Despite their best intentions, this song is quite dull. So this is not the best work that i have heard from Electroscope. It is interesting, and i suppose that fans of early psychedlia might quite enjoy it. I wonder though, is this an early release or is it indicative of the direction they are moving in now? I have no way of knowing, becuase (as seems to often be the case with vinyl these days) no one bothered to stamp a friggin date on the damned thing, so i can't find out when it was released. 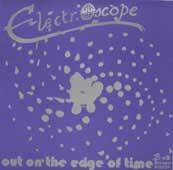 Overall, i recommend the work of Electroscope, just avoid this one unless you really like old psychedelia.